The in situ adapter is a single piece of machined aluminium and apart from regular cleaning with water and a mild laboratory cleaning detergent, is completely maintenance free. The design allows easy removal of glass slides via the corner cut-outs. 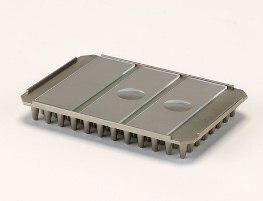 The aluminium perimeter ridge is a further design feature which allows the thermal cycler lid to be closed without risking damage to glass slides and PCR samples.